For a taste of the waterfall-filled drainages far below Grandfather Mountain, it’s hard to beat Hunt Fish Falls near the border of Avery and Caldwell counties. It’s a short and fairly steep hike to reach this swimming hole, one of many hiding near the Wilson Creek National Wild and Scenic River. Marked by white and yellow blazes, the trail descends moderately into a rhododendron-filled hanging valley, where it follows alongside a stream. It turns away from the stream and does a switchback before reaching Lost Cove Creek and the top of Hunt Fish Falls. This is a prime summer destination. 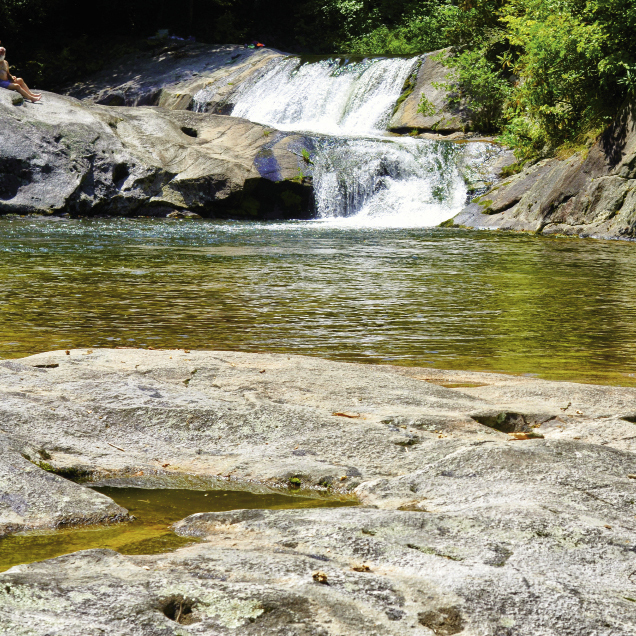 The waterside rocks and sand spits offer access to deep pools near primitive campsites in the surrounding forest. Retrace your steps to return, or head further downhill to check out Pisgah National Forest’s Mortimer Campground (offering showers and mountain-biking trails), Betsey’s Old Time Country Store, and Caldwell County’s Wilson Creek Visitor Center.